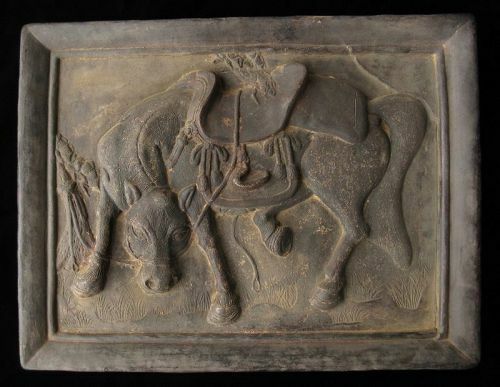 Whimsical rendering of a high relief horse (uma) tied to a pine trunk. The horse is completely harnessed with its kura and abumi fittings. The finish is untouched showing signs of age and patina. 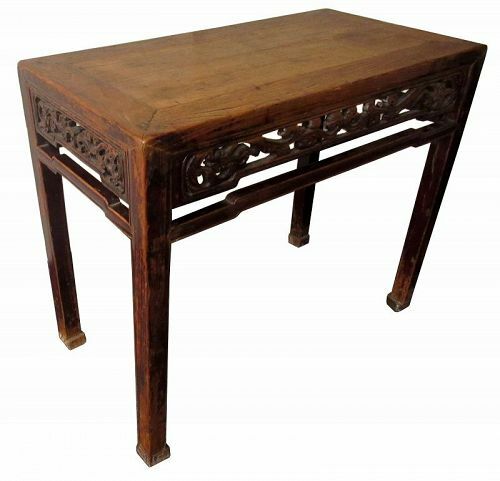 Dimensions: 19 7/8" x 15 1/2" x 1 3/4"
Chinese hardwood table made from jumu (elm) wood. 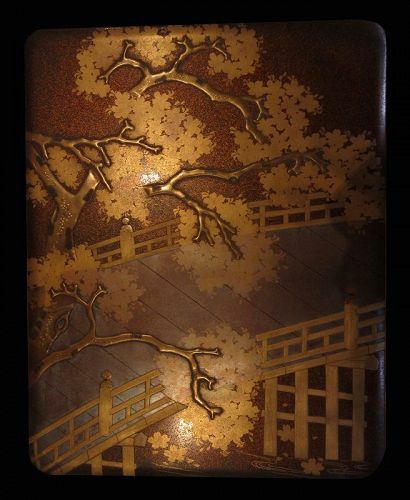 The sides of the table are carved with pierced panels of dragons and clouds. The four feet are carved with spirals. Original condition. The forked arrowhead (karimata) was named after its resemblance to the V-formation flight of wild geese. Such arrows of different sizes were highly prized on the battlefield and for hunting large game. 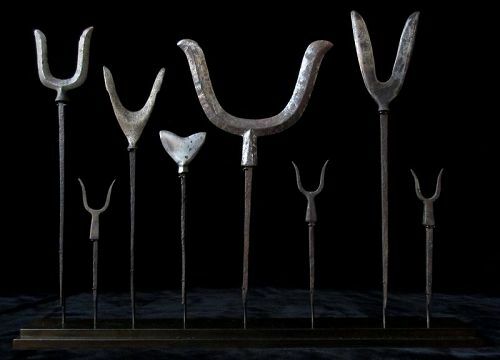 The Japanese arrowheads, many resembling miniature spears, were made in hundreds of varied shapes of folded, tempered steel. 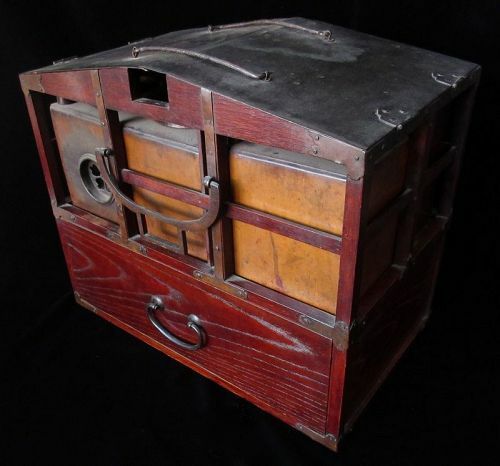 Japanese munitions strong box constructed of Hinoki wood, with hand forged iron banding and with hard mounts. Original finish and condition. 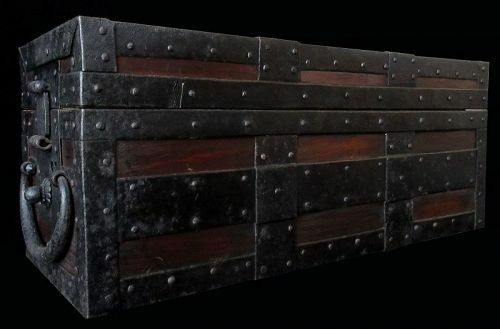 16 1/8" x 6 1/2" x 5 3/4"
The three-sided style of the phurba comes from an ancient tool used to pin down sacrifices. The phurba has 3 segments to represent its power to transform negative energies. These energies are known as the "three poisons" and are attachment, ignorance, and aversion. The 3 sides of the phurba also represent the 3 spirit worlds and the phurba itself unites those worlds. 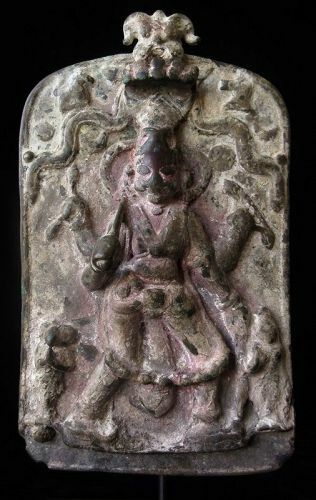 The handle of the phurba represents "wisdom" while the blade represents "methods". 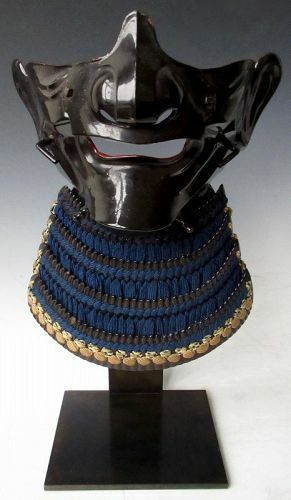 A slight smile menpo in black lacquer, with angular high cheeks, making its naturalistic ears protrude outward. The L shaped strap holders are mounted on the dimples, the sleek shaped chin with turned strap post and a small hole to vent out perspiration. The interior of the mask is lacquered in red leather. 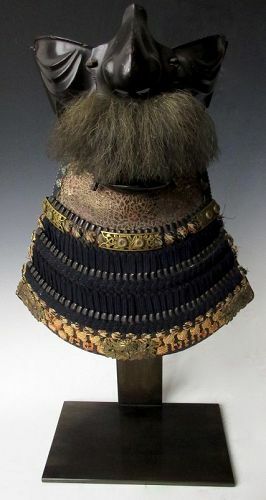 The yodare is in the kiritsuke style plates of four and is laced in blue silk, calico, and pale ocher. The menpo is mounted on steel stand for display.